This past weekend, I finally (finally!) got caught up on pretty much all of my mainstream books. Which was a bit of a feat, because my pile of "new" comics had become unwieldy. And, not to mention, a bit dated. Since the weekend, I've managed to rack up an impressive new stack of unread books, but that's just part of the game, I guess. But, since I'm actually kinda current when it comes to comics--really for the first time in about half-a-year--I'd like to eke out a post or two about it. 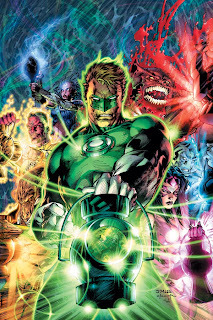 And in that spirit (of lazy blogging), today I want to do a little bit of a mishmash post about comics--talking about everything from Blackest Night to a quote by Eric Powell about indie comics and his call to the entire industry. So, yeah. Little bit of everything today. Starting with Blackest Night, though, I just wanted to mention how much I'm enjoying this series as it nears its conclusion. And I think one of the main reasons why I'm digging the series so much is because it seems fairly self-contained. Sure, there are a bunch of tie-ins, but to me at least, they really don't seem all that integral to the main story. 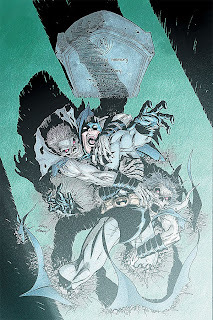 Two of the better-selling titles involved in the crossover were the Blackest Night: Batman and Blackest Night: Superman mini-series, and, while they were well-crafted stories, I didn't think they added much to the overall arc of Blackest Night. On the other hand, Greg Rucka's Blackest Night: Wonder Woman three-issue series, while not mandatory to enjoy the main book, managed to add quite a bit to the narrative. With that title especially, and the Geoff Johns-penned Green Lantern regular series, there are moments that make the whole story better. In that sense, the event has felt a bit like an old Marvel event, where everything is cohesive and all the stories bleed into each other. And, in the case of Blackest Night, I mean that literally. It's a gruesome story, it's a horrific story, but it still feels like a Silver Age story. There are tons of characters, there's a Big Bad that no one can beat on their own, and the stakes are incredibly high. It's just great super hero comics, is all. But the coolest part about Blackest Night is, if you stick to the main book, you're going to be able to get the whole story. And in today's world of comics, that's something pretty unique. "Don't get me wrong. I loves me some super heroes. I just don't want our industry controlled by them anymore. I wonder what would have happened if J.K. Rowling had released Harry Potter as a comic instead of a novel. I think I can safely say that it probably would have sold 5,000 copies at best. We as a whole, creators, publishers, retailers, and readers, need to start giving good ideas a chance and stop making everything about superheroes created in the thirties and sixties. Yeah, I know that's the argument people have been making for the past twenty years, but we have to try harder." It's from Newsarama, and you can read the entire interview here. Take a moment, read it, think about it. We'll reconvene this weekend to discuss.